Long before Sony formally announced PS4 Neo as a legitimate piece of hardware, a report emerged claiming to have not only identified the company’s mid-generational hardware upgrade, but also its inherent specs. Now, it appears those documents have leaked online. First spotted by the folks over at WCCF Tech, the images look to have been taken from an internal presentation, outlining technical specifications, instructions for developers and much more. Granted, Sony is yet to release a comment at the time of writing, though it’s a safe bet that these images are real, if outdated. Above all, the platform-holder stresses that the PS4 Neo will coexist with the current PlayStation 4, noting that, from October 2016 — the rumored due date of Sony’s hardware refresh — all games will run on both console SKUs. Bouncing off that, online services including the PlayStation Store will remain the same on both Neo and PS4, a uniformity that stretches to system software and the application package. 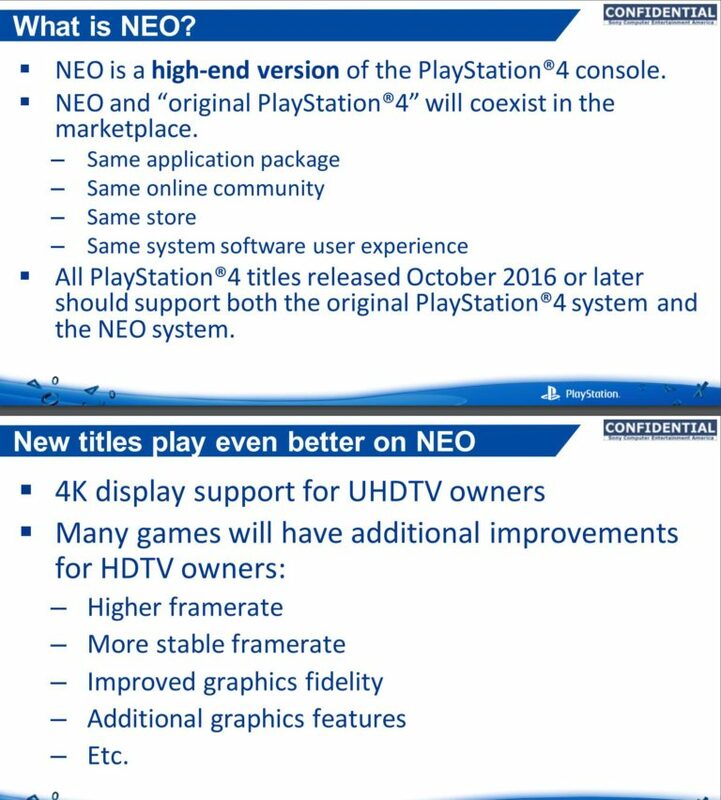 These documents also double down on the fact that the updated PS4 is built with 4K TV owners in mind, and will automatically switch to the Neo mode to take advantage of the higher resolution threshold. Whether older titles — that is, games released before PS4 Neo debuts — will run on the new system is something that Sony will leave to developers, who will seemingly have final say on whether or not they implement a patch. All of this and more is illustrated in the gallery below, but keep in mind that these documents appear to be at least two-to-three months old. In related news, the current PlayStation 4 was once again the best-selling console in North America last month.